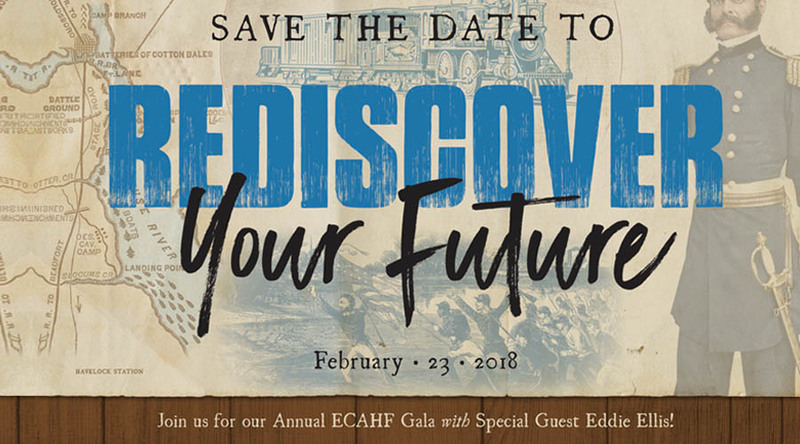 If you like trains, if you’re interested in the Civil War, if you’re curious about what life was like in Craven and Carteret County a hundred years before Cherry Point was built, then don’t miss the Eastern Carolina Aviation Heritage Foundation Gala. We are pleased to have our very own historian and author Eddie Ellis back with us again. He’s promised to bring fresh insights, new stories and recent discoveries about coastal Carolina sure to entertain and enlighten all who attend. More amazing tales of our local history with a little archeology thrown in this time. Don’t miss it! Eddie Ellis will help the audience “Rediscover Your Future” by exploring the rich history of our region and how it has shaped the future. Proceeds from the event will benefit Eastern Carolina Aviation Heritage Foundation in our efforts to inspire young learners to pursue new and exciting career pathways through STEM (Science, Technology, Engineering and Math) education. Join us for Annual ECAHF as we travel back in time like never before with the extraordinary talents of Author & Historian Eddie Ellis!